Located on the popular Cascade Beach Rd. perfect for taking a stroll or bike ride. Table Rock is a Lake Superior Cabin located on Cascade Beach Road in Lutsen, MN. 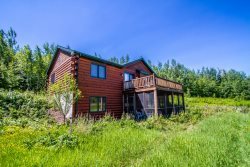 This cozy three bedroom, two bathroom cabin is located on a wooded lot with a private section of Lake Superior Shoreline. At Table Rock you are just steps away from Lake Superior. Enjoy great Lake Superior views from the homes large lake-facing deck. The living features a flat screen TV and is open to the kitchen sorry, fireplace currently non-functional. You will love the high ceilings and windows in this cabin. The living room flows nicely into the dining area and the kitchen. The kitchen is equipped with everything you`ll need to prepare a meal during your stay. Enjoy the Lake Superior views while you cook. Plenty of room for more than one cook to be in the kitchen at a time. In the east section of the home you will find the master bedroom- complete with a queen sized murphy bed and desk. The sliding glass doors lead out to the deck and provide lots of natural light and views of Lake Superior. Pull down the murphy bed at night and fall asleep listening to the waves. Enjoy great views and even some little visitors see the humming bird from the master bedroom. The second bedroom has a full bed and is located on the west end of the home near the living room. Table Rock has an open cabin lay-out, meaning the two west end bedrooms have walls that do not go all the way up to the ceiling and they are separated by curtains. Those looking for privacy should note this. The second bedroom also features a full bed and is open to the living room area. A curtain provides some privacy for the bedroom, but, again, it should be noted that the walls do not go all the way up to the ceiling. The larger bedroom, located on the east side of the home near the master bedroom, has a shower/tub combo. The smaller bathroom, located on the west end of the home, has a small walk-in shower stall. The laundry area is located on the east end of the home. Separating the east and west ends of the cabin you will find a cute sitting area- great for curling up with a good book. The large, lake-facing deck is a guest favorite. Accessed from the living room, sitting room, and master bedroom, there is plenty of room for everyone to sit back and relax. Listen to the waves lap against the shoreline from the deck. The humming birds are not shy and will visit even when someone is on the deck. The views from the deck are incredible. Just trees, ledge rock, and lake. What more could you want Table Rock is located on the very popular Cascade Beach Road, just a couple of miles outside of downtown Lutsen. The shoreline is an easy, gentle sloping hike down from the home. The view of Table Rock as seen from your private section of shoreline. The view from the other side of the shoreline area. Looking west down toward Lutsen. Looking out at the sweeping views of Lake Superior. Looking east toward Grand Marais. As you can see, you have lots of privacy at Table Rock. Table Rock, named for the large, flat ledge rock that the home sits on, is situated on 150 feet of private shoreline. This adorable cabin is located on the Lutsen start of the Cascade Beach Rd., a popular destination for many. The large lake-facing deck is a great spot to sit out with a cup of coffee and watch the waves splashing against the shoreline just a few feet away. This cozy cabin features three bedrooms and two bathrooms on one easy access level. The raised, open ceiling of this cabin and it's cabin-style interior means there are no walls that go all the way up to the ceiling, so each bedroom is semi-private. Many love how open and airy it makes the cabin feel, especially during the warm summer months. It's a no-thrills log cabin, choosing instead to focus on the natural beauty surrounding the home, especially enchanting Lake Superior. At Table Rock you are conveniently located just up Highway 61 from downtown Lutsen and only 5 minutes to Superior National at Lutsen Golf Course and the Lutsen Mountains Ski and Recreation Area, which offers many activities during the summer months, including an alpine slide and sight-seeing gondola to the summit of Moose Mountain. Take a short drive up the shore to Cascade River State park where you will find an enchanting waterfall after a short, easy hike. You are close to many dining options including the Lakeside Dining Room and Poplar River Pub at Lutsen Resort, Moguls Grille & Tap Room at Caribou Highlands, and Papa Charlie's Restaurant & Tavern at Eagle Ridge Resort, all of which feature live music from popular local musicians throughout the year. Grand Marais is just a 15-minute drive up the shore where you can spend a day shopping and dining in the town's many unique shops and restaurants while enjoying a hike out to Artist's Point or just a stroll around the Harbor. Table Rock is not far from our Sister's Cabin so would be perfect for a larger group that would need two homes, but it is still private enough for someone renting Table Rock for a quiet get-away. Table Rock is a seasonal cabin open May-October. Near Superior Golf Course, Hiking Trails, Lutsen Mt. This is a perfect cabin in a perfect location. It is secluded, with many homey family touches and yet it has all the modern conveniences. The bed in the bedroom on the tight really needs a new mattress. It is very uncomfortable and lumpy. The handyman (Greg) was friendly, prompt, and knowledgeable. The owner of CVR (Steve) was courteous, and handled the septic issue quickly. We were very impressed and grateful. Table Rock is one of the rare vintage cabins on the North Shore. Its warm wood interior is spacious, cheerful, and comfortable. We love the master suite, where its so close to the water its like being aboard a ship. Access to the lake is so easy, we spent hours enjoying the wind and waves. Its so nice to have a DVD player and cozy chairs, laundry, and a microwave, since we cook most our meals. Everything works great, the skylights keep it bright, and the handmade quilts are a loving reminder of the original owners. Always had a good experience through Cascade. This cabin offered an excellent lakeside retreat. Location was easy to find and within only a few minutes from Lutsen and under 20 miles to Grand Marias this was an ideal spot. The shoreline was large and well secluded. Home offered everything needed for a perfect getaway. Definitely a must try for the reasonable cost. From the moment we drove up, we knew we would love this place. It's exactly what a cabin should be: nice but not fancy, cozy but roomy, private but not isolated. You can tell it's a well-loved family's home. Perfect location close to the water with a roomy deck, the simple built-ins in the bedrooms were charming, there were books tucked everywhere, comfy furniture, nice soft towels provided by CVR. We can't wait to return next summer. We loved the place! It is our favorite so far. Unfortunately, we left a day early as the mosquitoes were relentless and kept getting in the cabin even though we did our best to keep them out! It felt like we were camping! It was also too uncomfortable sleeping/too hot - didn't find the fans until the day we left :( I would definitely come back though - LOVED the place!!!! We loved the cabin overall. The view was phenomenal! Would have liked to have a working fireplace, but appreciated being able to have a fire outside. The amenities were a plus also (washer and dryer). Very nice cabin. Great place to have a bonfire on the shore. Feeding and watching the birds and chipmunks was a hoot. We loved the home. It was so well equipped and easy access to the Lake, which is what we travel a thousand miles for every summer/fall from Kansas. The only suggestion we have is to clear the yard and driveway a little better to make it easier to get in and out. We have a Chevrolet Silverado truck and it was a little bit hard to get in and out. Nothing major though. We loved our stay at Table Rock. The view of the lake was amazing, the house was so welcoming and the chipmunks were very fun to watch in the morning. We really appreciated the house having two bathrooms and a washer and dryer.